During July, our head gardener, Liesl van der Walt spent two weeks gardening at the Prieure Notre Dame D’ Orsan in France, which is the home of the architect Patrice Taravella, who designed the gardens at Babylonstoren. In Part I of her travel diary, Liesl shares what she learned about pruning. At Orsan, Patrice has created a garden to compliment the old convent buildings that date from the Middle Ages. Patrice’s design very effectively captures the spirit of that time, when gardens had to feed the body, and also provide spiritual food and peace of mind for meditation. I especially went to learn from the head gardener, Gilles Guillot who has been part of the Orsan team for almost 20 years. I wanted to discover how they maintain their beautiful creation. 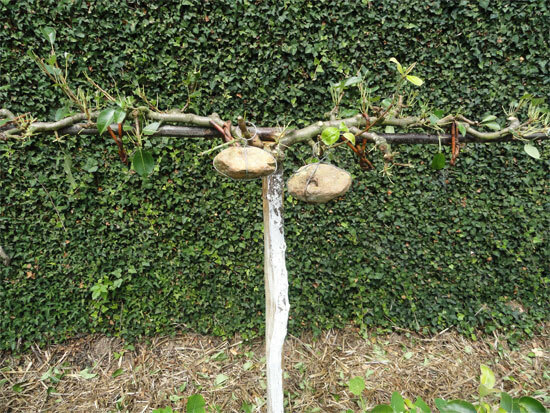 As an introduction to the historical pruning techniques the French use to create different forms of fruit trees, Gilles got me practising on the climbing roses, with which he uses many of the same techniques. 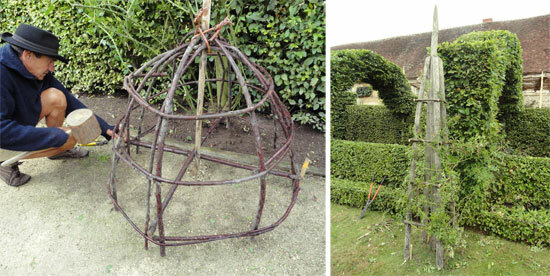 We pruned the old fashioned roses like Souvenir de la Malmaison and Mme. Alfred Carriere, both of which flower only once in spring. It was fascinating to train the roses back after cutting out the old wood, onto the different shaped structures that Gilles makes from chestnut wood. After much practice, Gilles finally allowed me to work on his precious fruit trees, some that take 15-20 or more years to reach their final shape. 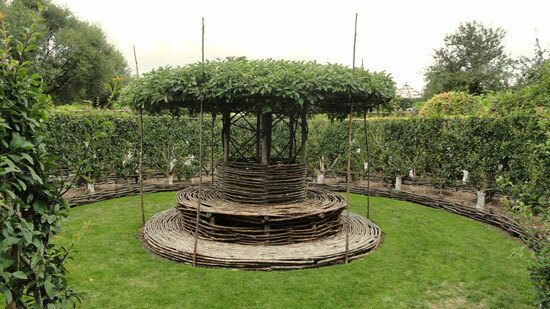 We started with the summer prune which is done this time of the year mainly to control the fast growth. Much to my surprise he continued stripping some of the apples and pears of their leaves to give me the experience of pruning in winter when the trees are dormant and the important cutting back is done to shape the trees and stimulate fruit. More next week, about Liesl’s time in the vegetable garden.